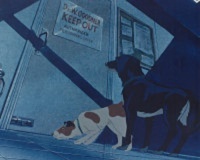 There's a great animated film from 1982 The Plague Dogs based on the the 1977 novel of the same name by Richard Adams. This film was directed by Martin Rosen who also directed Watership Down - another animated film based on Richard Adam's novel. A friend of mine drew my attention to this film due to the fact that vivisection and animal cruelty are main messages in the story. 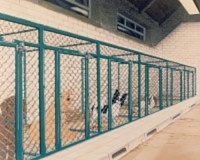 Here's the synopsis from Wikipedia: Rowf (a Labrador-mix) and Snitter (a smooth fox terrier) are two of many dogs used for experimental purposes at an animal research facility in the Lake District of north-western England. Snitter has had his brain experimented upon while Rowf has been drowned and resuscitated repeatedly. 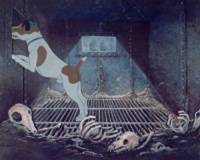 One evening, Snitter squeezes under his cage and into Rowf's, where they discover his cage is unlatched. Eager to escape the tortures of life inside the facility, they explore, knocking over other cages and finally sneaking into the incinerator, where they are nearly killed before escaping. Initially relieved and eager to experience their new freedom, the dogs are soon faced not only with the realities of life in the wild but with another more terrifying realisation—they are being hunted by their former captors. They come to reluctantly befriend 'the tod', a Geordie-accented fox, in order to obtain food in the wild, initially farm sheep grazing on the local hills. Snitter hopes for a new home, but after accidentally killing a man by stepping onto the trigger of his gun as he climbs up to him, he too loses hope. As time passes they both grow thin and bony, having to steal more and more food: The tod assists them by distracting a lab-hired gunman who then falls to his death; his corpse is beset upon by the hungry pair. As they wander about aimlessly, the army and the media are roped into the pursuit, driven by rumours of the pair carrying bubonic plague and murdering sheep and even humans. Australia was the first country to release the unedited version (103 minutes) until the UK version (86 mins) was released in 2008. On YouTube there is the original uncut UK version, divided into 10 parts. Please see below for each of the videos and I hope you enjoy the film!